"Life is made of moments, small pieces of silver amidst long stretches of tedium. It would be wonderful if they came to us unsummoned, but particularly in lives as busy as the ones most of us lead now, that won't happen. We have to teach ourselves now to live, really live...to love the journey, not the destination." 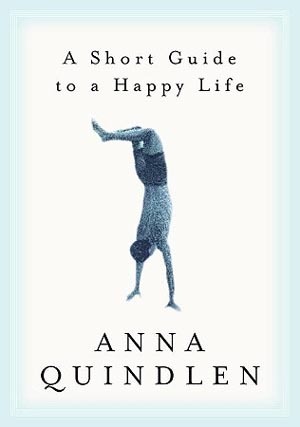 In this treasure of a book, Anna Quindlen, the bestselling novelist and columnist, reflects on what it takes to "get a life"—to live deeply every day and from your own unique self, rather than merely to exist through your days. "Knowledge of our own mortality is the greatest gift God ever gives us," Quindlen writes, "because unless you know the clock is ticking, it is so easy to waste our days, our lives." Her mother died when Quindlen was nineteen: "It was the dividing line between seeing the world in black and white, and in Technicolor. The lights came on for the darkest possible reason....I learned something enduring, in a very short period of time, about life. And that was that it was glorious, and that you had no business taking it for granted." But how to live from that perspective, to fully engage in our days? In A Short Guide to a Happy Life, Quindlen guides us with an understanding that comes from knowing how to see the view, the richness in living.